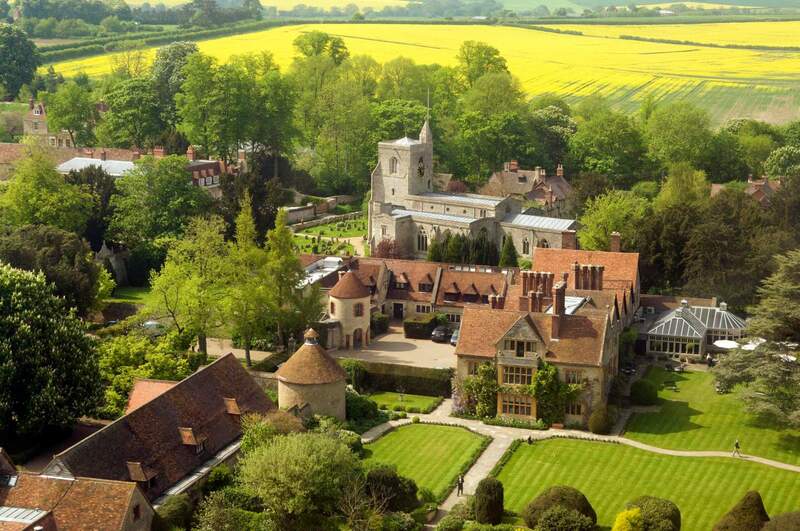 There is a log fire blazing in the hearth, and jugs of coffee and trays of miniature pistachio shortbread are free flowing – outside the rain is gently falling on the famous gardens of Belmond Le Manoir Aux Quat’Saisons where we are preparing for a day long cookery class celebrating ‘The magic of vegetables, pulses and herbs’. 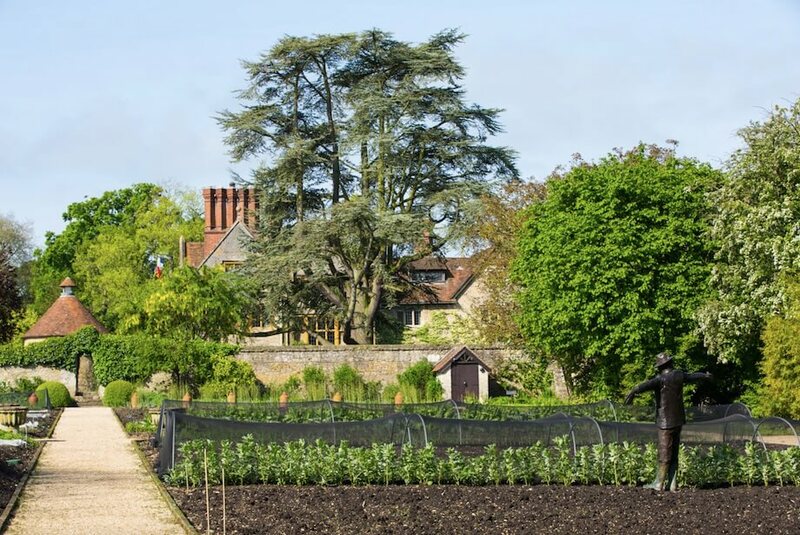 In spring, with the first peas and broad beans already appearing, the brief excitement of morels and wild garlic, and the prospect of asparagus on the way, there could hardly be a better time for it. 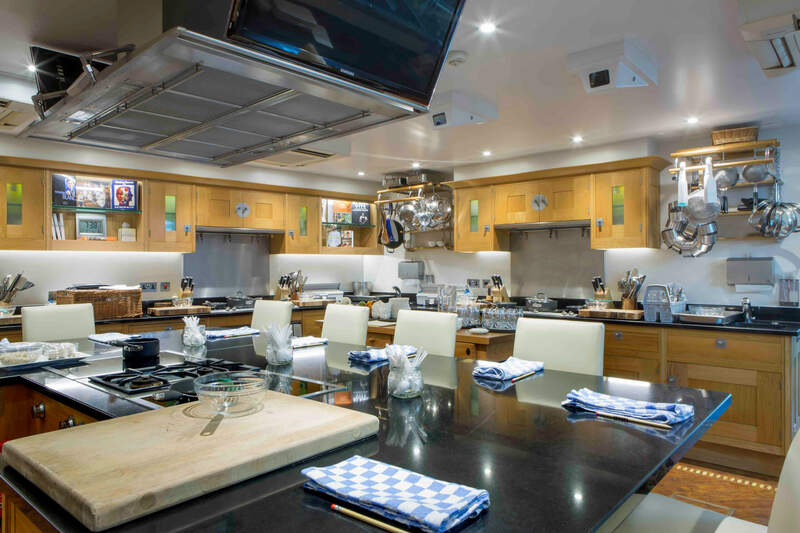 And what a place to cook; the sheer luxury of this place is almost overwhelming, but in the best possible way – nothing is too much trouble, but nothing is over complicated – it turns out to be one of the friendliest and relaxed cooking classes I’ve ever done. Our tutor for the day is Becca Boast, an already accomplished young chef who was mentored by Michel Roux Jnr and has been at Le Manoir for five years, and she explains the menu we’ll be making and learning; from a breakfasty dish of poached eggs on tomato fondue, to a white bean salad with a wild garlic pistou, a heartier wild mushroom risotto and a carrot cake to finish. We will be trying everything as we go along: we will certainly not leave hungry. We begin with breakfast, and Becca is full of advice for the perfect poached egg – surprisingly she puts three into one bowl before dropping the lot into a pan of boiling water to prove that they won’t all stick together, but somehow separate perfectly into individual eggs. Get the water to a good roiling boil, she says, stir it briskly, then pop the eggs in carefully and turn it off. Walk away. About three minutes later they will be done, with the minimum of fuss. Perfectly poached eggs, runny yolks and none of that horrid uncooked white, served on a rich, herby sauce of cherry tomatoes. Not a bad start to any day. Obviously after all that hard work, it’s time to relax – so we watch while Becca knocks up a couple of soups before we go back to our work stations to somewhat inelegantly juilienne some raw carrots, spring onions and chard to stuff inside Vietnamese rice paper rolls, dunked into a soy and garlic dipping sauce. All this, of course, a pre-lunch snack before we cook our main dish, the risotto. The stock, which Becca made earlier from simple button mushrooms (suprisingly no need for expensive wild ones, given enough time to develop the flavour from ordinary ones), has been on the go since first thing. Time for another brilliant cooking tip: it turns out there is no need to constantly stir a risotto from the outset in order to achieve that perfectly creamy finish. We start the rice with onion and garlic, add water – leave it to cook gently – then add almost all the mushroom stock (leaving a spoonful or two for the end), leave it again, then two minutes before it’s done, stir fairly vigorously to release the starch from the rice. We follow the instructions, frying handfuls of buttery wild mushrooms to stir through and pile on top, with parmesan and a genius addition of truffled whipped cream. (Sadly I fail completely to master the art of quenelling. Becca suggests practising in front of the telly with a tub of margarine, but for now a dollop will have to do.) We end up tucking into bowls of glorious, perfectly cooked risotto. The dream. Time for a rest, obviously, as we watch the making of a white bean salad with that pistou – more beans pureed into a velvety, yet dairy-free soup – and it’s on to carrot cake. Definitely another recipe I will make again and again at home – this one uses Cotswold Gold rapeseed oil, which has a light clean flavour which doesn’t interfere with the cake, and plenty of golden raisins and chopped walnuts along with mixed spice. It smells amazing even before it comes out of the oven. Luckily Becca has made one slightly earlier, cooled down enough for a thick layer of orange zest spiked cream cheese frosting, and as if we had not been eating constantly all day long, we slice up large wedges of it with cups of tea. There is another cake too, the ones we made ourselves, boxed up to take home for the next day. There is just time for a last walk around the beautiful gardens, which even in the rain are a joy to see, before reluctantly heading home. 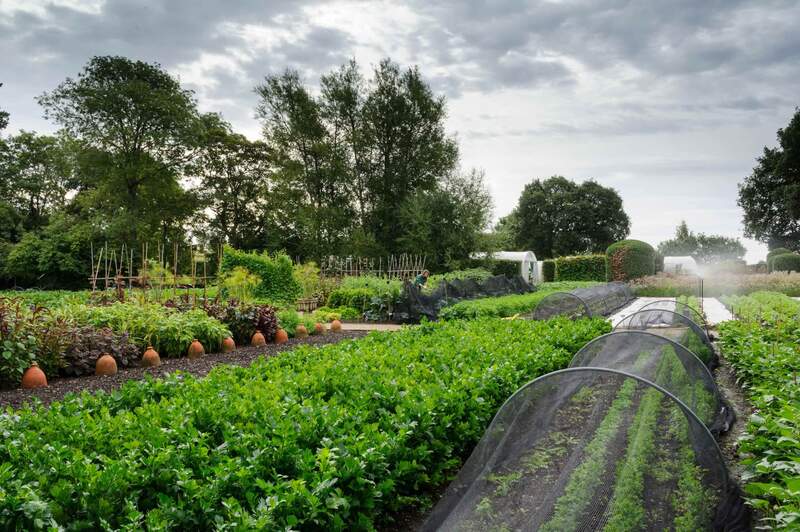 The entire Le Manoir experience is one of incredible largesse and generosity; if not the most hands-on, this was definitely the most relaxing and stress-free cooking class I’ve ever done, and along with the cake, a host of tips and new techniques and veg-based recipes to use again. One to save up for, if you are able, for a big birthday, or a special treat. 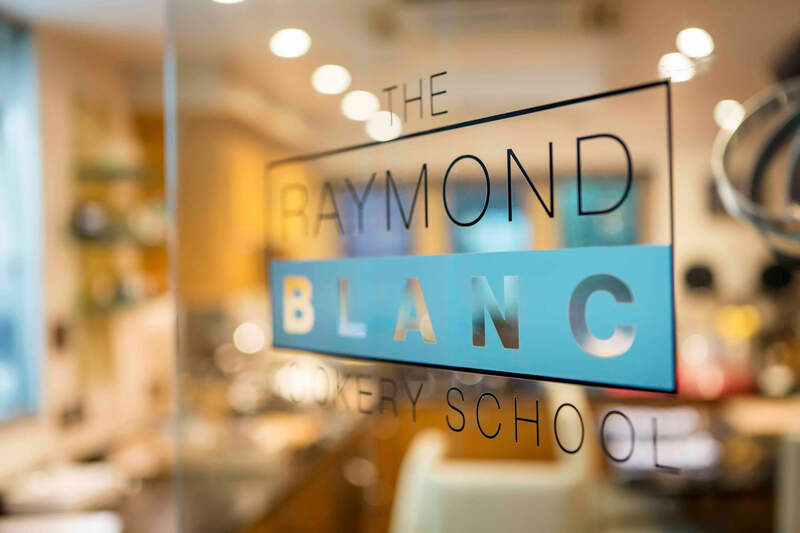 The Raymond Blanc Cookery School runs a range of classes, both half and full day courses, as well as longer residential ones – details and booking on their website here.